CCP was happy to welcome our 17 visitors from California; students from Western Christian School and representatives of our medical mission partner, Simply2Love. The team arrived in high spirits, you would never guess they�d just been traveling 20-some hours! 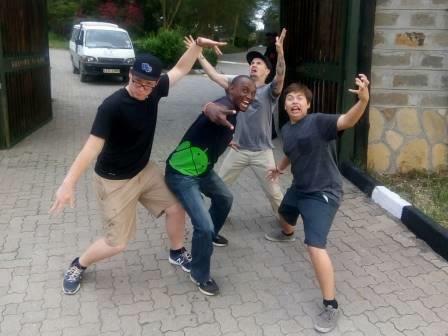 After a quick debrief and delicious traditional Kenyan dinner at the guest house, our friends crashed to get some needed rest before Lake Nakuru field trip the next day with the 7th and 8th graders of CCP Academy. A chilly, overcast morning greeted the visiting team, CCP staff, and CCP Academy 7th and 8th grade students as they loaded up the buses heading to Lake Nakuru for the day. Separated amongst the CCP students, our visitors had quality time to bond with the kiddos. More time than expected as the usual 2-hour ride took 6 hours because of an accident on the highway. As a detour, our 3 buses roughed their way through the African bush to bypass the accident. This was half of the adventure of the day! When we arrived to Nakuru, the buses each had their own game drive through the park. All of the creatures fascinated the kids, from baboons to zebras, giraffes, water buffalo, exotic birds, and even rhinos. A buffet lunch was served and gratefully accepted since it was quite late in the day at this point. Although it was a long day on the bus, the visitors enjoyed spending time with the kids and CCP staff, as did we cherish their presence with us! Christina is ready for lunch! Peaking out of the bus, hoping to see some wildlife!